The latest Transformers chapter from Michael Boom! 'Splosions! Bay is called Transformers: The Last Knight, and it is not the worst Transformers movie Bay has ever made. Some people would say that the studio is taking a chance giving Bay a $260 million budget to make this movie, but even the worst Transformers movies have eclipsed that box office mark several times over. One of the big issues with this movie is that it feels like the box office was the motivation as, once again, Bay is simply incapable of telling a good story. Let's start this off by saying that Transformers: The Last Knight has one of the most coherent story lines in the entire franchise, which is actually saying a lot. I could follow the plot, even if I did not understand much of it. The movie starts out with King Arthur and, for some reason, the Autobot Knights decide to trust Merlin, even though Merlin is revealed to be a drunken fraud. Not only do the Knights trust Merlin, they make his legend immortal and turn Merlin into the Merlin we know today. What? 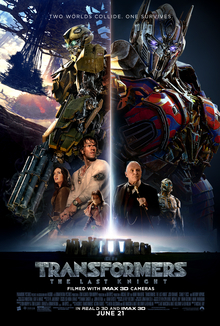 You didn't know that the Autobots were responsible for the Arthurian legend of Merlin? Oh, you naive soul. Bay gets at least two stars for this movie for finally realizing that he cannot just throw Transformers into these movies without identifying them first. We are told, either by captions on the screen or by the robots introducing themselves, who every single Autobot and Decepitcon is throughout the movie. I appreciated that so much I even said out loud, "Thank you, Michael." To which my grandson said, "What? What did you say?" Nothing little guy, go back to your Kindle. I think one of the reasons I dislike Bay movies so much is that he throws so much at you all at once that it is hard to understand what is going on. The movie clocks in at around two hours and 20 minutes, but he shoves so much into that time that it becomes confusing. Not only that, but Bay drags the end out for what seems like an eternity. The ending was easily 15 to 20 minutes too long, and by the time it got going it was not nearly as interesting as it should have been. The one area of this movie where I differ from many of my reviewing counterparts is the role of Anthony Hopkins. I laughed more at this movie than I did at Sausage Party thanks to Anthony Hopkins and his British robot counterpart. The scene where the British robot (known as Cogman) was driving the car like a 16-year-old while listening to his music and Anthony Hopkins was going right along with it was probably the funniest scene in any movie of 2017 so far. Cogman did more to maintain my interest in the story than even Optimus Prime, whose scenes were all covered in the prerequisite amount of cheese that Optimus is covered with throughout this entire series. When people say that Bay has problems telling a story, they are referring to movies such as Transformers: The Last Knight. We transition from scene to scene with almost no background information, and we watch things unfold that seem to make no sense. While the plot line does seem to run through the movie in a relatively consistent manner, it also feels like there is a lot Bay is not telling us that leaves us confused. Michael Boom! 'Splosions! Bay still does not understand that awesome action scenes should be subordinate to the story and not the main part of the story. His 'Splosions! start early in the movie and after two hours of them, they get to be old and stale. Transformers: The Last Knight is a fun popcorn movie that goes over well at the drive-in. It has plenty to look at, but don't bother trying to follow the story. Bay has said that he will probably not direct any future installments in this franchise, which could be the only thing that saves this franchise from extinction. George N Root III is a movie fanatic who offers more than meets the eye. Follow him on Twitter @georgenroot3, or send him a message at georgenroot3@gmail.com. Boom! 'Splosions!